News > True or False? Proposed Australian (state) divisions in 1838 had Perth in Victoria, Shark Bay and Broome in Dampieria, Darwin in Tasmania, Esperance in Nuytsland, Sydney and Melbourne in Guelphia, Brisbane in Cooksland, Townsville in Torresia, Adelaide in Flindersland, and Hobart still in Van Dieman's Land . Have a look at this Historic Map from the Royal Geographical Society Volume 8, 1838, "Considerations on the Political Geography and Geographical Nomenclature of Australia by Captain Vetch, Royal Engineers, F.R.S." 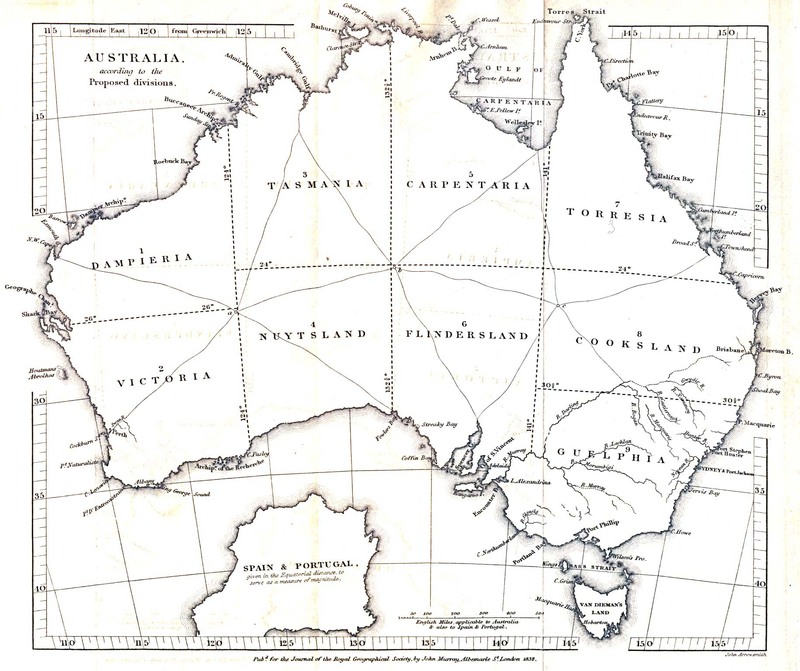 There are also additional new links to Old Australian Maps in our Genealogy Links Table, look under the Maps and Gazeteers category. You are here News > True or False?